The purpose of this qualitative study was to measure the effectiveness of a new reusable learning object design model for elementary mathematics. 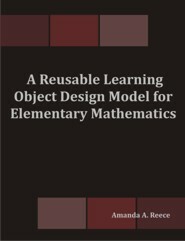 This study was motivated by the lack of general reusable learning object design models and, specifically, elementary mathematics design models that include both technical and learning specifications. The research design method was a qualitative Delphi technique and included participants across the United States and other countries. Ten participants were provided the design model and a questionnaire to analyze the effectiveness of the model on the online instructional design process. Two rounds of questionnaire responses and model refinements were conducted, at which point a consensus was reached. As a result of the data collected, the elementary mathematics reusable learning object (EM-RLO) design model was modified to focus equally on technical and learning specifications for designing elementary mathematics reusable learning objects. The results of the Delphi process indicated that the design model did contribute to the online instructional design process by introducing a pre-assessment procedure at the beginning of the design process. This model's placement of the pre-assessment function has the potential to result in the creation of more effective and beneficial instructional designs for online learning in elementary mathematics.